“If you love cheese please copy and paste this status on your timeline. If you do, a pound will be donated to Cheese Lovers Anonymous. If you don’t, children will die and the terrorists will win. I know only 1% of my Facebook friends will do this and that means the rest of you are twats.” Of course I immediately copied this into my timeline. Anyway, as I scrolled on, I happened upon a couple of photos of runners finishing a race in lovely sunshine at what appeared to be Littlehampton Marina. On closer inspection there was a caption reading ‘First runners starting to come in at the Arun River Marathon’. That’s nice I thought. Jason from Sussex Trail Events is posting a few pictures of last years race to get us in the mood for tomorrow. But something wasn’t quite right. I felt uneasy, nervous if you will, that something was afoot. I tentatively typed the web address of Sussex Trail Events to satisfy my growing sense of disquiet. However I was to become disquieter. To my horror, I read that the Arun River Marathon, which I knew to be on Sunday 17th May, because all races are on the Sunday of a weekend apart from parkrun, that’s the law………was in fact on the Saturday, today. How Far Is A Marathon Anyway? What???? A full marathon on a Saturday? Who does that? This was no tin pot organisation either. This was Sussex Trail Events, a proper bona-fide race events company. That said, they do have a history. 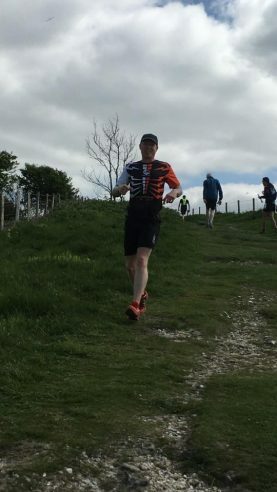 Back in January of the same year, my running partner Richard and I had entered the Dark Star River Marathon only to find it was ‘around’ 28 miles rather than the regulation 26.2. Understandably we were shocked and appalled, so perhaps this latest debacle should have come as no surprise. Fast forward 12 months and Richard and I are on the start line of the Arun River Marathon 2016, suntanned and fresh from our adventures in La Palma at the Transvulcania Ultra. I say suntanned, I was suntanned. Richard still looked like an albino who’s painted himself white and run through a snow storm whilst washing his hair in milk. He had been ‘injured’ last year which is why he hadn’t run. I say injured. He had a hurty leg because he didn’t know how to run properly. A bit of advice from someone who did, a minor alteration to his running style and, oh, look, all of a sudden “I’m not injured anymore”. The hooter went and off we all trotted from the cafe at Littlehampton Marina on a rather chilly overcast SATURDAY morning in West Sussex. Richard and I were both wearing our Transvulcania technical t-shirts because……well just because. 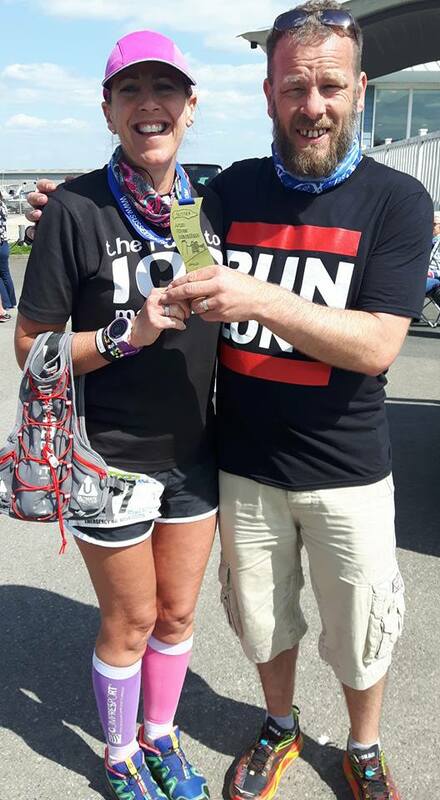 We were surrounded by running friends, Mark Johnson on 130 marathons, Samantha Maton doing her very first marathon with her friend, also called Samantha. 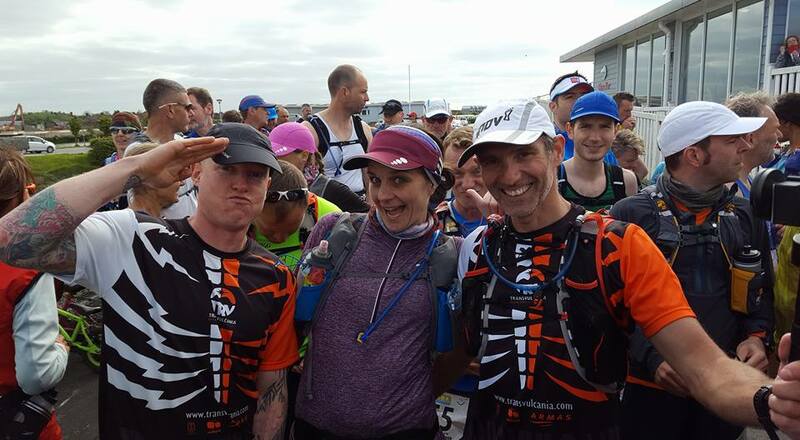 Zoe Norman and Liam who have just signed up for next year’s Transvulcania Marathon distance. 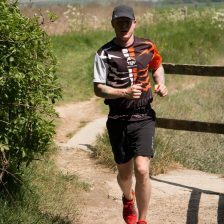 Paul Loader doing his first marathon since suffering a severe ankle injury which kept him out for 18 months. Laura Newell, Paul Coe with his GoPro….Who carries a camera round a marathon? Must be so heavy and cumbersome. Ah well, each to their own I guess. James Bennett was there, who I filmed at the Paris Marathon, and Paul Sargent was there going for the win as usual. Comrades hero Nuala Smyth, Paul Coates, Andy Pumphrey, Jake Fletcher, Helen Moss, Ben who I met at the Heartbreaker Marathon and probably a ton of other people I missed. Richard disappeared in the first mile, as is his wont. I ran the first 8 miles or so along the river bank to Arundel and beyond with Mark Johnson and the two Samanthas. We were chugging along at 5:30 per kilometre and I felt pretty good. The sun began to make an appearance by about mile 10 and I ran much of the next 6 miles with Andy Waters. The route follows the west bank of the River Arun most of the way up, although it cuts a corner after the hamlet of South Stoke and goes through North Stoke and rejoins the river just south of Houghton. The race reaches a bridge at Amberley and for the next couple of miles the route heads east up hill on to the South Downs Way. On the way up I saw Paul Sargent coming down in second place, James Bennett in third and Paul Loader in 4th. A little further on Richard came past in about 16th position. The views from here were beautiful. I could see for miles across the fields to the north. You can see it clearly on the video. The aid station at 13 miles is about half way to Washington and the A24. It signals the turn point and from there it’s back along the top of the Downs and down the hill following exactly the same route along the river bank back to Littlehampton. I was feeling quite strong so decided to bound down the hill at crazy pace. Not the best idea I’ve ever had and it left me pretty wrecked for the rest of the race. As we crossed the bouncy bridge at Amberley I could sense people starting to get away from me. Andy disappeared, Ben disappeared and then people started to catch me. By mile 18 my legs were shot. Transvulcania was still having a big effect a week after the event. The sun was shining bright and hot by now and I really was enjoying the riverside. I wasn’t enjoying the running so much. I took my time at the final aid station drinking copious amounts of Coke and shovelling water melon down my throat. Paul Coates passed me. Helen Moss passed me. I had now adopted a walk 200 metres run 800 metres policy. 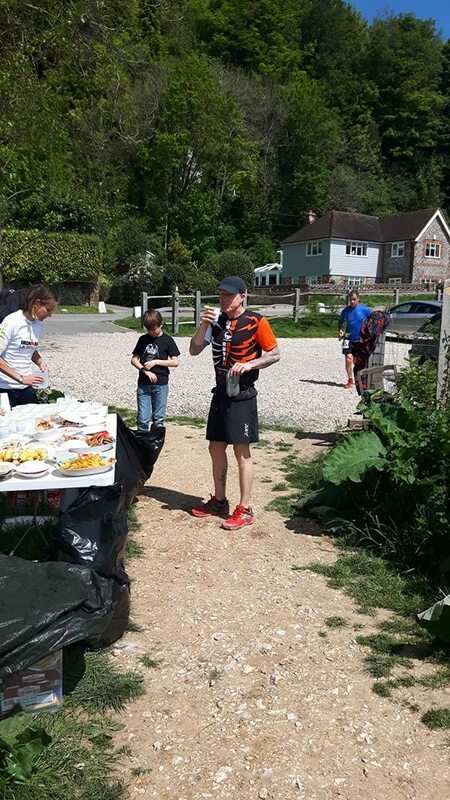 I reached the temporary water stop, manned by Chris Ette of Sussex Trail Events, with 4 miles to go and Mark Johnson caught me up and went on his way. Paul Coe came up behind me soon after, filming as he went. You can see his Arun River Marathon video here. This was becoming very hard work indeed! It shouldn’t really be hard work. It’s runable flat all the way along the river bank and the hill at half way isn’t too bad at all. There’s only 300m of gain in the entire race. Arun River Marathon should be a very pleasant run out. With a mile to go Nuala Smyth appeared behind me and was soon far ahead having given me a consoling pat on the back. It’s amazing how quickly people can put distance between them and you when you’re suffering. I finally dragged myself in to Littlehampton Marina car park and up to the finish line by the cafe. 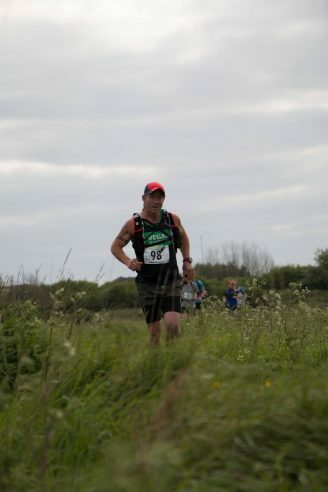 The best thing about finishing this marathon was getting a matching river shaped medal to go with my Sussex Trail Events Dark Star River Marathon medal. Richard had finished some time before although, having gone off crazy-fast as usual, apparently he too had suffered badly with Transvulcania legs in the latter stages. Jason said he looked wrecked when he crossed the line. I may not have looked wrecked but that’s probably because I hadn’t really run most of the last 6 miles! I had crossed the line in 4 hours and 43 minutes. The winning time was 3:12 by James Donald from Team Bath Athletics Club. Paul Sargent came in second in 3:22 and James Bennet third in 3:30. In his first marathon for many, many months Paul Loader came in 4th in 3:36. Richard was 24th in 4:09. Very well done to everyone who took part. I would say that I will be back at the Arun River Marathon next year for more of the same, but given that we are doing Transvulcania again I wonder if we might rest our legs for a little longer. That said, I know us. In a few months Richard will say “Come on we may as well do it, as a recovery run, for a laugh” and we’ll sign up. Thanks to Jay, Danny and Chris at Sussex Trail Events for another fine day out. Well stocked aid stations, pretty route and adequately marked….although I did go wrong at one point, but that was down to me filming and not paying attention to the way markers, which were clearly there! 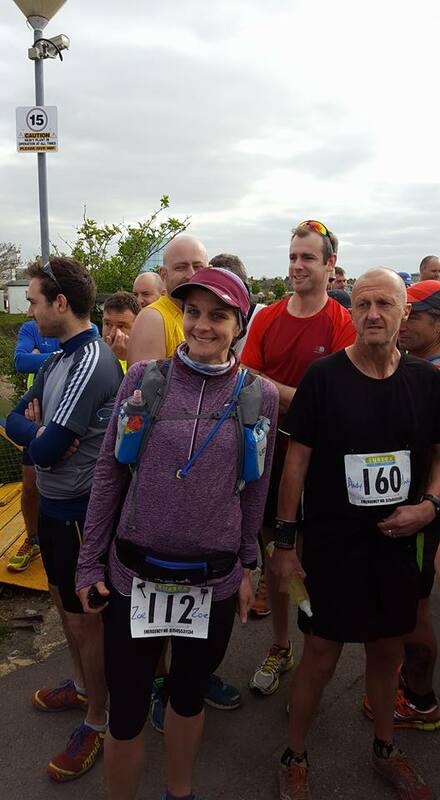 With that, thank you for reading and if you have enjoyed this Arun River Marathon race report and video please do share it with your friends and especially with anyone who might be considering doing the race in 2017. It is certainly a Film My Run recommended race and if you are a marathon runner in the south of England you’ve no excuse not to get yourself to Littlehampton next year. It would make an excellent first trail marathon as it’s not a demanding run but still gives you a little elevation to get your teeth in to. You know what? We will probably see you there next time! Don’t listen to this man when he refers to a ‘slight hill in the middle of the race that isn’t too bad’.